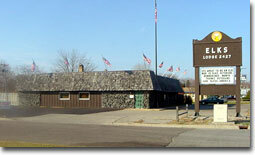 The Lodge Officers and members of Hutchinson Elks Lodge #2427 would like to welcome you to our Lodge. Since it's establishment, Hutchinson Elks Lodge has actively worked to meet the needs of our local youth, veterans, and community. We have also worked to support the charitable efforts of the Grand Lodge and our Minnesota State Elks Association. Meetings 1st and 3rd Thursday - 7:30pm.